From the Holy Monastery of Dionysiou on Mount Athos, this icon is the center of a set of icons called the Great Deisis, or Great Supplication, and was painted by the master iconographer Euphrosynos the Cretan in 1542. Deisis icons show the Lord facing outward in the center of a group of icons to the right and the left whose figures are turned towards Him with hands raised in supplication, for we know that it is only through prayer and supplication that our great infirmities of fallen humanity can be healed. This prayer reestablishes the normal and loving dependent relationship of man to God which was sundered in Paradise when Adam and Eve fell into a distorted and ficticious perception of the universe, deceived by Satan, or the Adversary, which sees our self-will and self-rule as desireable without a moment by moment dependence on God. What a terrible disease that we inherit and reaffirm by our own fallen ideas and perception. How terrible indeed! 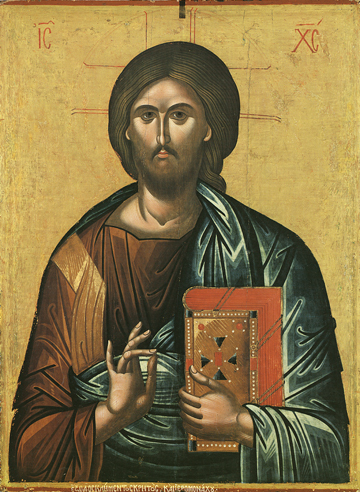 This is a magnificent icon of Christ with no visible damage over the centuries. The Lord is blessing us with His right hand and His left hand holds a jewel-studded Gospel to teach us faith.